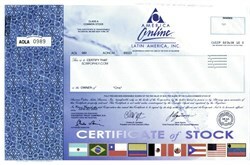 Beautifully engraved certificate from America Online - Latin America, Inc. This historic document was printed by the Security Columbian Banknote Company and has an ornate border with a vignette of the AOL logo and color flags of the countries served in Latin America along with the U.S. flag. This item has the printed signatures of the Company�s President ( Charles Herington ) and Secretary. America Online Latin America, Inc. based in Fort Lauderdale, Florida is the exclusive provider of AOL-branded services in Latin America and quickly became one of the leading Internet and interactive services providers in the region. 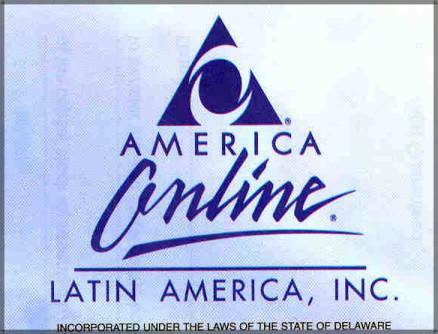 AOL Latin America launched its first service, America Online Brazil, in November 1999, and began as a joint venture of America Online, Inc., a wholly owned subsidiary of AOL Time Warner Inc. (NYSE: AOL), and the Cisneros Group of Companies. Banco Ita�, a leading Brazilian bank, is also a minority stockholder of AOL Latin America. The Company combined the technology, brand name, infrastructure and relationships of AOL, the world's leader in branded interactive services, with the relationships, regional experience and extensive media assets of the Cisneros Group of Companies, one of the leading media groups in the Americas. Under President and CEO Charles Herington, AOL Latin America currently operated services in Brazil, Mexico and Argentina and serves members of the AOL-branded service in Puerto Rico.